On the morning of Sept. 11, 2001, a stunned world watched as the twin towers in Lower Manhattan collapsed in flames and smoke and dust. At 8:46 a.m., an American Airlines Boeing 767 carrying 92 people and 20,000 gallons of jet fuel had crashed into the north tower of the World Trade Center. Seventeen minutes later, a United Airlines flight with scores aboard, also a 767, slammed into the south tower. At 9:37 a.m., another American Airlines plane struck the Pentagon. Less than half an hour later, a United Airlines flight crashed into a field in Somerset County, Pennsylvania, after passengers fought with the terrorist hijackers who had pirated the plane. It was the deadliest attack on the United States in its history. All told, 2,997 people died in the day’s strikes, including the 19 radical Islamic hijackers. More than 6,000 people were injured. Two hundred sixty-five people died on the four planes; 125 were killed at the Pentagon. In and around the World Trade Center, 2,606 perished. “It was an intensely local and exceptionally global event,” said Allison Blais, the chief strategy officer for the National September 11 Memorial & Museum. 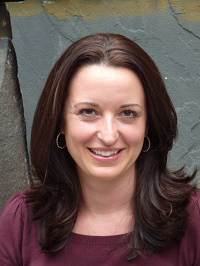 Blais, who oversees strategic planning, commemorations and events for the organization and is co-author of its official book, A Place of Remembrance, sees a natural connection between memorial and Chautauqua. Blais has her own 9/11 story. “I moved to New York in 2000, and on 9/11, I was working at the Public Theater/New York Shakespeare Festival,” she recalled. “I’d just come out of my subway stop about 20 blocks north of the World Trade Center when the first plane came right over my head. The roar was deafening, and I’ll always remember the sound — and really the feel — of the boom when it crashed into the North Tower. 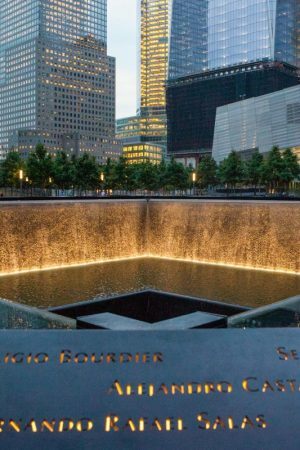 The World Trade Center Memorial opened in 2011, on the 10th anniversary of the attack, and the museum opened in 2014, but the determined drive to build a commemorative space arose while the rubble at ground zero was still smoldering, said Blais, who came aboard the project in 2004. 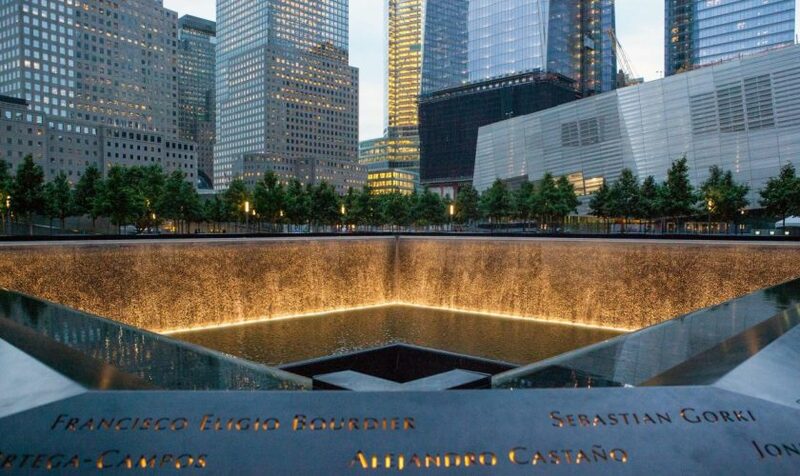 The memorial’s architect, Michael Arad, won a worldwide competition with his design, “Reflecting Absence,” which transformed the footprints of the twin towers into enormous waterfalls. They comprise the dramatic centerpiece of the complex on sacred ground in the nation’s largest city. But it is the names, the names of the dead, that make the space so moving. “Those names are etched through bronze-panel walls, and the sun shines through them in a way that makes each letter an absence,” Blais said. They are not arranged alphabetically; they are organized by what Arad calls “meaningful adjacencies.” The memorial’s staff reached out to family members to share stories about their lost loved ones. As best could be determined, information was gathered on where each person was that day, who they worked with, who they knew and loved and what they were doing in their final moments. An algorithm was created and software developed to identify connections, and the names are organized into nine groupings — one for the victims of the Feb. 26, 1993, bombing; two for the twin towers; four for the hijacked flights; one for the Pentagon; and one for the first responders, Blais said. Among those first responders on the wall are the 11 members of the nearby New York Fire Department’s Ladder Company 3, who answered the call that day. All of them died. One-quarter of all the names on the memorial belong to people who worked at the financial services firm Cantor Fitzgerald. At the time of the attack, the company occupied offices on the 101st to 105th floors of the north tower, just above where the first hijacked plane hit. Howard Lutnick, Cantor’s chairman and CEO, lost his brother Gary, his best friend, and more than 656 colleagues. Lutnik, who became a driving force behind the memorial, survived because he was dropping his son off for his first day of kindergarten that morning. Everyone in the Cantor offices was killed. Almost 40 million visitors have paid their respects at the site since it opened in 2011; 7 million to the memorial and 3 million to the museum each year, Blais said. “People come from all around the world, from 180 different countries,” she said, noting that those who died in 9/11 included citizens of 90 nations. And yet, some New Yorkers have stayed away, their trauma still fresh, their wounds not quite healed. Reporter’s note: This week, Chautauquans will explore “The Forgotten: History and Memory in the 21st Century.” This theme offers the chance to remember three of an army of forgotten Chautauquans whose lives, like unseen rocks in a stream bed, shaped Chautauqua’s current yesterday and today. This week, a three-part series introduces or re-introduces three Chautauquans: Monday, artist Will Larymore Smedley; Wednesday, author and poet Rebecca Richmond; Friday, author, Chautauqua public relations czar and entrepreneur Julius King. Residents and visitors may not immediately recognize their names, as neither street nor building exist in their honor. Born at the end of the 19th century, they lived most of their lives in the first half of the 20th century, that era of American energy and action. Their lives, talent and character suggest that they shared those national traits leavened by their unique, independent spirits. We remember them not because they were celebrated — we remember them because they seem to be models of lives well lived, an idea that Chautauqua embraces and encourages. Sometimes the glory of lives does not pass, it just hides until called in from the dark. If 21st-century readers and art aficionados do not recognize the name Will Larymore Smedley, they are not alone. His 20th-century neighbors might not have known him either. Smedley sought the shadows and lived unobtrusively with his wife, Adelaide Wilson, and daughter, Rose Thaline, at 11 Morris from 1908 until his death in 1957. If his repute jumped the fence, it was unremarked within the gates. But it is within the gates, far from the nation’s art centers, that Smedley sought and succeeded to balance a life of utopian ideal and economic reality. His life emerges from the shadows in the memories of Chautauquan Mary Ellen Sheridan, the Daily digital archives, local Jamestown newspaper articles, archives at Vassar College and Cornell University, and Chautauqua’s Oliver Archives Center. “It is hard to believe that in this century of the dramatic and in this age of advertising and publicity that a nationally-known master craftsman and artistic genius could have maintained his home so quietly for over 50 years so near to our busy Plaza,” Holder wrote. With the exception of his 1951 interview, there is more Daily reporting about him after his death than during his lifetime. That may be due to the fact that his wife, Adelaide, lived to be 101 and her many birthdays are reported. There were four Chautauqua posthumous exhibits of Smedley’s work, the last in 2002. Sheridan inherited the remnants of his work in 1988. “He left the self-marketing and pursuit of grand venues as a low priority,” she said. Recently, Sheridan said that he was monumental in her growing up. The only Daily interview with the man himself is dated July 6, 1951. Age may have mellowed his attitude toward publicity. Perhaps he saw the interview not as bragging, but a chance to share his ideas on art and reflect on the life he built. He saw no conflict between art and science. He was, after all, an 1896 graduate of Case School of Applied Science, Cleveland, Ohio. He commented about the technological changes which occurred in his lifetime, and was accepting of them. “Each generation is separate from the next and thinks in its own way. 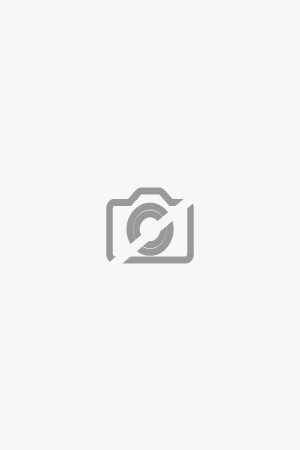 But there are truths which span even the greatest of technical change,” Smedley said. During the 1951 interview, Smedley said that Mark Twain had one of his paintings and the two corresponded. Two letters from Twain were featured in the 2002 Chautauqua exhibit of Smedley art. If his personal life is arresting, his artistic life is also. Smedley’s early career was marked by success and suggests he had confidence in his artistic talent. Though he graduated with a degree in engineering, he became an artist and a self- taught artist at that. askArt, a go-to site for artist biographies, states that he was “primarily self-taught.” This writer could find no mention anywhere that he took classes or studied with another artist. He exhibited at the National Academy of Design in 1903 and 1904. He had a studio in New York and his work is mentioned in articles from 1904 in The New York Times and Brooklyn Daily Eagle. The July 6, 1951, Daily interview with Adelaide Smedley asserts that he drew 300 illustrations for the 1904 first edition of Encyclopedia of Horticulture, written by Liberty Hyde Bailey and published by Cornell University Press. The Smedley family assertion presents something of an historical dilemma. There is no illustrator acknowledgement in the first issue of the Encyclopedia of Horticulture. A Cornell University archivist did not find any reference to Smedley in Bailey’s archives without intensive research in Bailey’s papers. This does not mean that it is not true, only that the science of history and the history itself are not always in sync. “I’m annoyed with Bailey that nowhere did he give Will credit. My father-in-law, Laurence Vintage Sheridan, a landscape architect, went through the first edition and only found one picture with Will’s initials,” said Sheridan. The arc of his professional life changed in 1906 when he was hired as a faculty member of the Los Angeles School of Art and Design. According to Black’s Daily 1934 comments, he “became home-sick, and after one day shook the job and shot back to his beloved Chautauqua.” If there were other reasons, they are unknown. Though Chautauqua was a refuge where Smedley and his wife could live the simple life they envisioned, he had to heed economic reality. Art was his life and living, and he faced that fact honestly and bluntly. 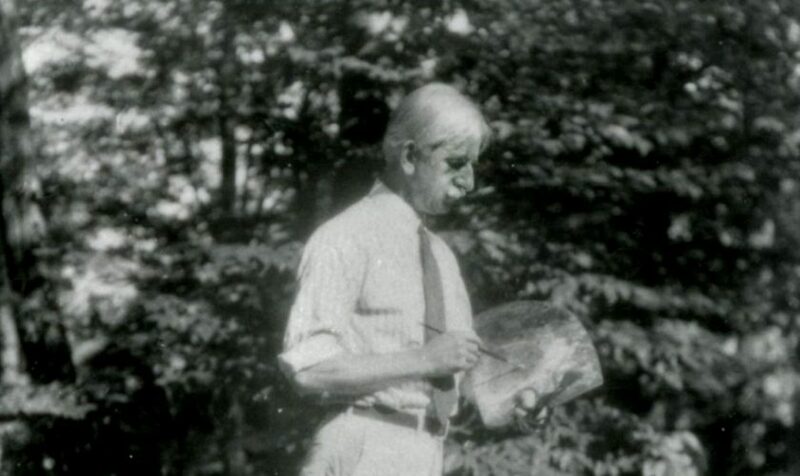 Smedley wrote in a 1912 Fine Arts Journal article, “without sales of their wares neither artist, nor baker nor candlestick maker can do their best.” He was not above soliciting consideration of his skill and offered his services to nature writer John Burroughs in a 1918 letter. Ironically, it’s the intersection of art and commerce which reveals much of Smedley’s artistic career after his move to Chautauqua County. He had studios at the Colonnade, Room 18. and the old Arcade, and advertised “Smedley Painting Class” in a 1917 issue of The International Studio. The Jamestown art community recognized his quality and in 1910 hired him to teach at the Jamestown Brush and Pencil Club. In 1916, the club exhibited 35 of his oil and watercolors. The Jamestown Evening Journal reported that three to four hundred people viewed the show. This writer could not find information about his paintings after 1937. 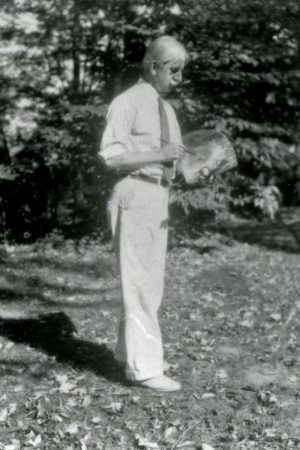 Julius King acknowledged him as science consultant for King’s 1934 publication Talking Leaves and 1936 publication of Wild Flowers at a Glance. Sheridan said that Smedley continued to do magazine illustrations, private commissions and magazine articles. On July 13 at the Patterson Library, Westfield, Sheridan auctioned the Will Larymore Smedley paintings and drawings she had lovingly guarded since 1988. Among the paintings was “Forest Idyll,” the 1903 National Academy painting which the Smedleys had kept all their lives. After spending time with Smedley in the archives and listening to Sheridan’s memories, there was something bittersweet about watching Smedley’s paintings leave her care, akin to watching a friend’s possessions in stranger’s arms. Smedley would return to the shadows, his art hanging on unknown walls. But history is capricious and may have another plan. Sheridan reported that Julia Klevin plans to hang the paintings she purchased at the auction on the walls of her future Westfield business. 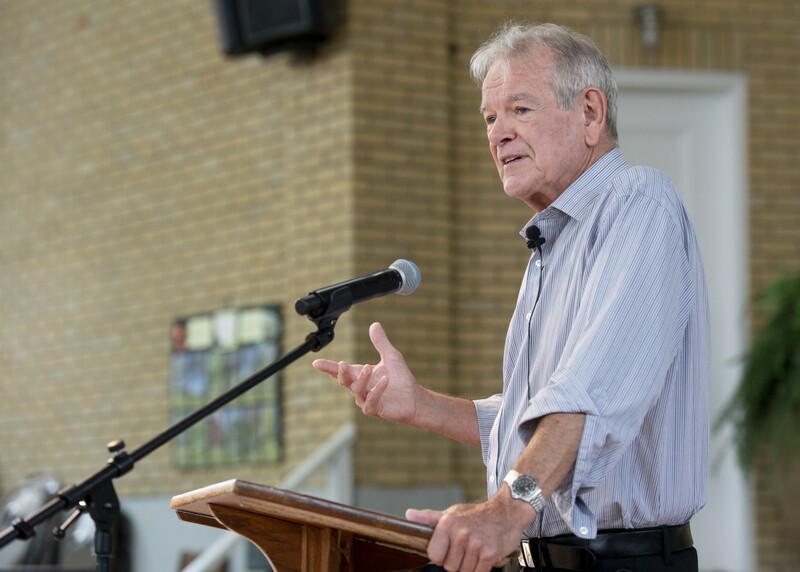 On July 23, historian Ralph Young used the Amphitheater stage to discuss dissent and its prominence in American history — from the first pilgrims who voyaged to America in the 17th century to the counterculture movements of the 1970s. From July 24 to 26 in Smith Wilkes Hall, Young spoke to members of the Bestor Society and Eleanor B. Daugherty Society about dissent in America during the Scholar in Residence program. Starting at 8:30 a.m. each morning until 10:15 a.m., he discussed the roots of dissent in America, beginning in 15th-century Europe to the modern era. 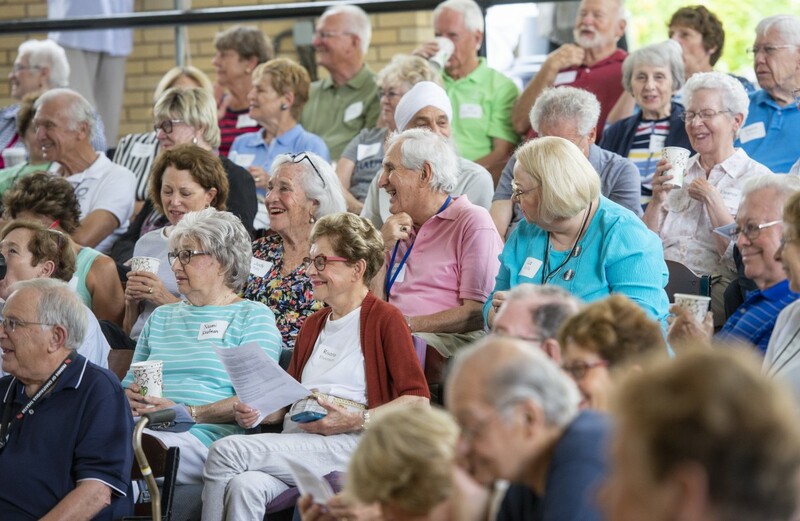 Members of the Bestor Society include Chautauquans who donate $3,500 or more to the Chautauqua Fund each year, and those who join the Daugherty Society have included Chautauqua in their will or have made a planned gift. Since 1991, the Scholar in Residence program has been a way for the Chautauqua Foundation to thank these donors for their support. The Scholar in Residence program has been funded by the Edward L. Anderson Jr. Foundation for the past eight seasons. The Anderson Foundation supports arts, educational and environmental events and initiatives put on by various organizations. Steven Anderson described his father as someone who had a passion for learning, and the foundation carries on his legacy. The Scholar in Residence program explores a different topic every year, and he said his family’s foundation hopes to continue funding for future years. 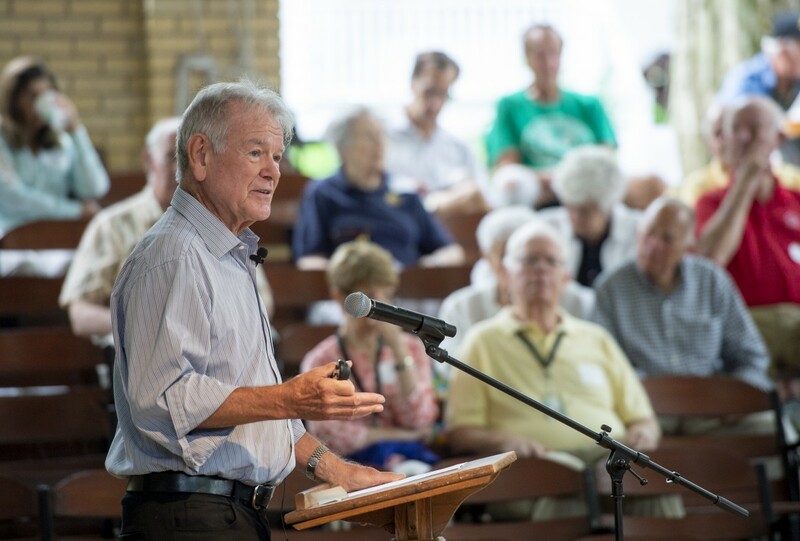 This season, Young touched on a number of topics throughout the three-day program and how those topics related to the roots of dissent in America. He discussed the Protestant Reformation in the 16th century and connected that movement to the pilgrims settling in the new world. He went on to talk about the Revolutionary War, Henry David Thoreau’s “Civil Disobedience” and Martin Luther King Jr.’s “Letter from a Birmingham Jail,” in addition to other issues and events, spanning 600 years of history. The Chautauqua Oliver Archives Center can be a quiet place — all those dusty documents. But not today, when it hosts an absolute plethora of people and purposes: a banner tour with information on how those relics are restored and cared for; Jon Schmitz and Bill Flanders, signing and selling their book in the Postcard History Series: Chautauqua Institution; and Ed Harmon, signing and selling his most recent compilation of “Well, That’s Chautauqua,” cartoons, satires and spoofs of life on the grounds. The activities, titled “Some Banners, Mosaics, Postcards and Cartoons at Chautauqua,” begin at 3:30 p.m. today in the Archives building. Charlotte Crittenden, banner committee member and year-round resident, will command the banner room in the Archives, answering questions about banners’ upkeep and restoration. Of the 162 Chautauqua Literary and Scientific Circle banners, 54 have arrived in their resting place in the Archives. The others reside in Alumni Hall. But images of all the banners are up to date and available in the banner book, The Banners and Mosaics of Chautauqua (also available for sale today), originally compiled in 1992 by Ish Pedersen and recently updated by Mary Lee Talbot, vice president for history and tradition for the CLSC. In addition to the banners, the book includes images of the mosaics in the Hall of Philosophy, CLSC class symbols that speak to the educational concerns of each class. In addition to activities at the Archives, Pioneer Hall will be open. “Pioneer Hall is really the closest thing to a museum on the grounds,” Talbot said. Mike Sullivan, former director for institution relations, requested the book of postcards. Flanders selected most of the cards to be included. The postcards provide a history of Chautauqua, and the book conveys the flavor of Chautauqua vacation: the learning, the leisure, the recreation. For his part of the project, Schmitz dealt with the publisher, wrote the introductions to the book and chapters and together with Flanders, did further research on the postcards, corrections and rewrites. “Well, that’s Chautauqua,” has become a phrase associated with Ed Harmon, longtime Chautauquan and unofficial cartoonist for the Institution. His work regularly appears in The Chautauquan Daily. Ellie, Harmon’s wife, sat beside him, smiling. It was a curious time. The country was in Depression, tempered with the memory of World War I, the war that was to end all war, but aware of unsettling political rumblings in Europe inviting outside intervention. Chautauqua was playing it close to the vest. “As near as we can tell from the research into the printed page, we were not very adventurous at the time,” Jacobsen said. Chautauqua Institution had been relatively stable. “There was a confidence here that was not indicative of the rest of the country,” Bendiksen said. By 1931, Augustine Smith had been music director for 10 years. Albert Stoessel made his first appearance as conductor in 1921, and beginning with his first full season in 1923, he brought sustained musical distinction to the Institution through 1943. 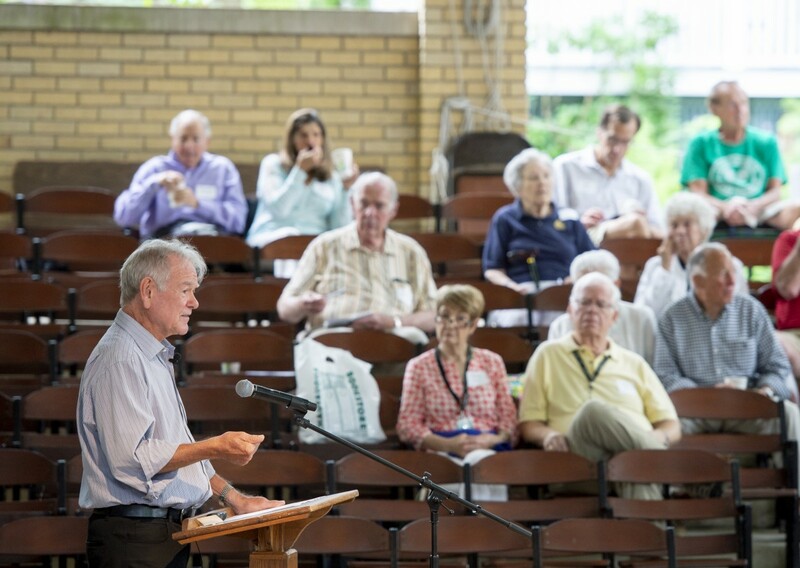 Leadership of Chautauqua — President Arthur E. Bestor and Shailer Mathews in the Department of Religious Work — “held Chautauqua on a centrist course,” Bendiksen said. But within that, “trying to pull together the stability and change required quite a dance amid wars and depression,” Bendiksen said. In 1929, and then in 1931, Norton Hall and Hurlbut Church, respectively, were built — both emblematic of Art Deco architecture and of the dance between stability and change. The buildings’ appearance on Pratt Avenue created a kind of stability row, adding to the solid brick buildings around the Plaza but adding a creative, Art Deco flow. “We tried to find hymns that were representative of the Institution,” Jacobsen said. The hymn “Nearer, My God, To Thee,” was sung at the very first Chautauqua, and it is still sung at Old First Night, Jacobsen said. He made special mention of the windows. “I’m happy to be in Hurlbut,” Jacobsen said. While Chautauqua had been on the cutting edge of religious hymn education and promotion, by the 1930s, “there was a lot of inertia. Nobody in that era wanted to be adventurous in singing hymns,” Jacobsen said. And there will be some Gershwin. “The dance is the way Chatuauqaua did the middle road,” Bendiksen said, and hymns reflected how Chautauqua reacted to the time between wars. Willard Sterne Randall encountered history at a young age, growing up in Philadelphia, seeing history of the revolution all around him and following his father’s footsteps — from Valley Forge to Gettysburg, wherever their 1950 convertible would take them. The author of a dozen books, Randall will speak on his most recent subject, Ethan Allen, at 3:30 p.m. today in the Hall of Philosophy. The lecture is part of the Oliver Archives Heritage Lecture Series. A book signing will follow. Always interested in history, Randall went to work for a daily newspaper at the age of 18. He wrote occasional history columns about local events. He was so busy working as a journalist that he didn’t have time for organized school, although he was learning all the same. “I didn’t go to college right away,” Randall said. He went at night for nine years, dropping more courses than he completed. “I just didn’t have time to complete the coursework all the time,” he said. He nonetheless knew what to do with his time. Randall completed his undergraduate degree at the age of 40, having already written five books. He eventually went on to finish graduate school, but he didn’t let that stop him; he continued writing, especially biographies. Upon moving to Vermont in 1984, Randall found it strange there had not been much written about Ethan Allen, patriot and Revolutionary War hero. Allen had founded the state of Vermont. Randall said that Allen was irrepressible; no matter how many setbacks he encountered, he got back on his feet and charged ahead. The Revolutionary War and Founding Fathers such as Ethan Allen are of particular interest today, and there is a current spate of books being published on the Revolutionary War period. 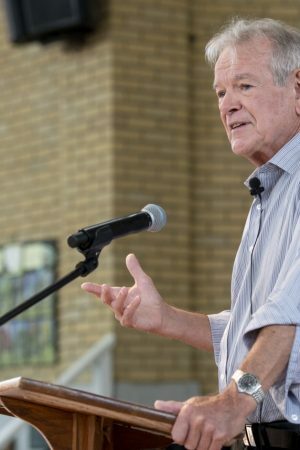 “People wonder about how well government is working and wonder what was the original idea of the founders,” Randall said. The country started in an economic crisis, and people want to know how debt was dealt with after the revolution. Vermont had paid its own way, Randall said. Allen opposed giving money to help out the other thirteen states. Even today, the people of Vermont have questioned government. In his career as journalist and historian, Randall received the National Magazine Award for Public Service from Columbia University’s Graduate School of Journalism, the Hillman Prize, the Loeb Award and three Pulitzer Prize nominations during his 17-year journalism career in Philadelphia. After completing his graduate studies in history at Princeton University, he turned to writing biographies, which also have garnered three Pulitzer nominations, according to Randall’s website. It might be that the name, Mary Frances Bestor Cram, is a mouthful. On the other hand, she had a lot to say. Her father, Arthur Bestor, presided over Chautauqua for some 30 years — through two world wars and the Depression. One remarkable event during those years was Franklin Delano Roosevelt’s visit to Chautauqua in August 1936, when he gave his “I Hate War” speech. Roosevelt’s speech and Bestor Cram’s reminiscence of the president’s visit will be the subject of the Oliver Archives Heritage Lecture at 3:30 p.m. today in the Hall of Christ. Presiding over today’s activity will be Jon Schmitz, Chautauqua’s archivist and historian, and Greg Peterson, chairman of Jamestown’s Robert H. Jackson Center Board of Directors. 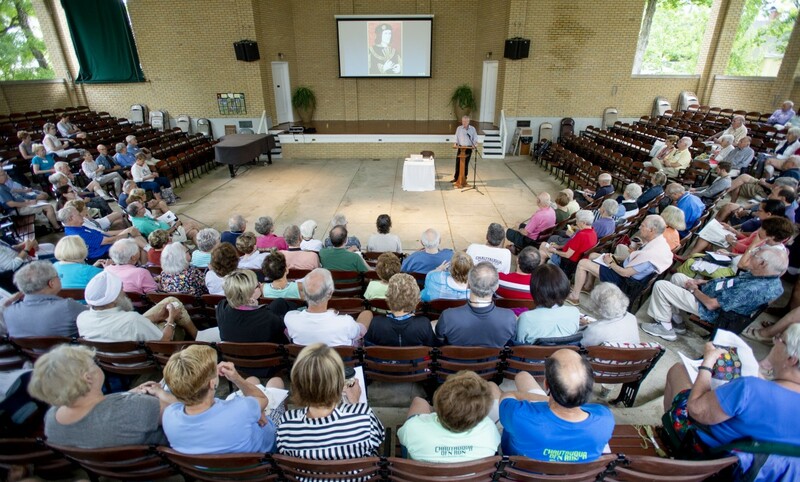 The speech and Roosevelt’s presence on the grounds stand as important moments in Chautauqua’s history. The Institution was just emerging from difficult financial circumstances, and the presence of such a formidable figure generated a lot of attention. Roosevelt became yet another in the series of presidents who have come to Chautauqua. And the speech itself is something of a curiosity, being, at least in title, an anti-war speech, delivered at a time when the rumblings of war were becoming audible in Europe and northern Africa. “Roosevelt didn’t want to look like an interventionist, even as he had to intervene,” Schmitz said. The speech as represented in the statement, “I hate war,” was a personal claim made in a public arena, but the public reality was otherwise. Schmitz said Roosevelt knew war was coming, but, just like many American citizens, he hated the idea of war. “Roosevelt had a way of calming people and focusing attention on issues productively,” Schmitz said. 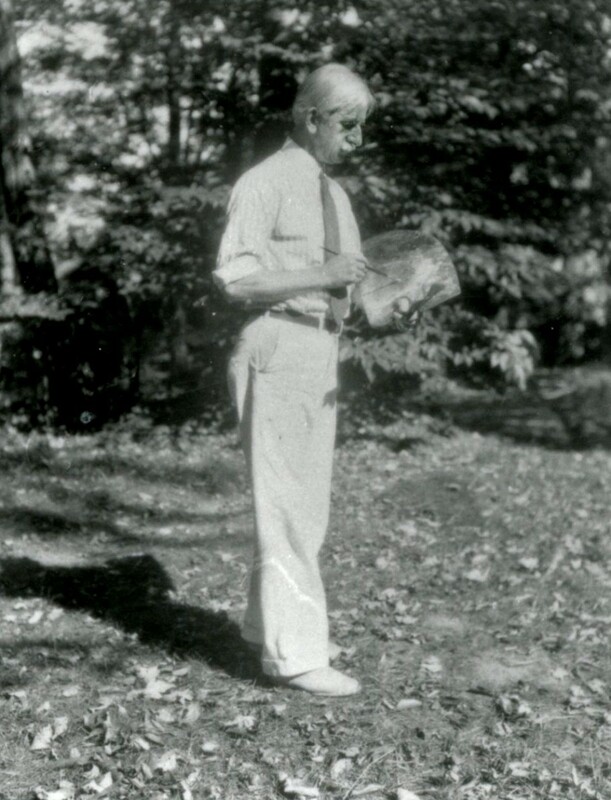 Roosevelt came to Chautauqua with just a few days’ notice. Security was tight. 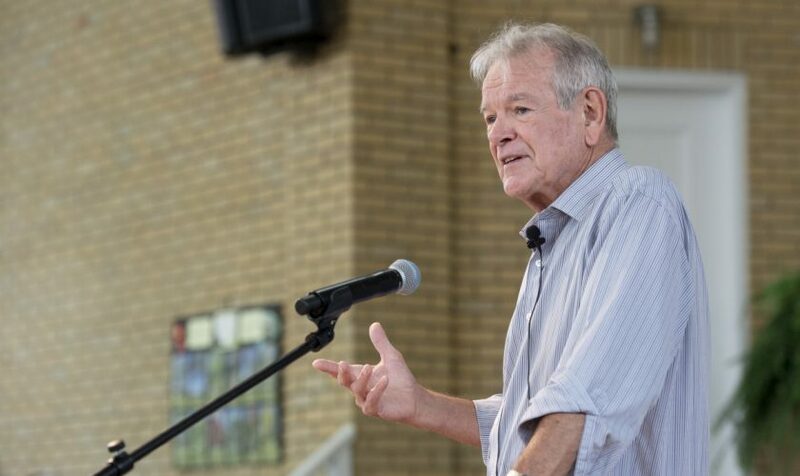 “He came because he felt he could reach a large audience by way of radio,” Schmitz said. It all caused quite a stir on the grounds. Some of the drama of the occasion is captured in Bestor Cram’s memoir of Chautauqua, Chautauqua Salute: A Memoir of the Bestor Years. More intimate will be Peterson’s 2004 interview with Bestor Cram. Peterson brought her to the Jackson Center for a tour and a showing of the 16-minute “I Hate War” film — a showing of which will be included in today’s program. Peterson then interviewed Bestor Cram, providing a rare first-person account of Roosevelt’s visit to Chautauqua, including the preparation, her father’s relationship with the president and the circumstances of the invitation. In conjunction with this 75th anniversary of the speech and Roosevelt’s presidential visit to Chautauqua will be an exhibit at the Oliver Archives relating to the five presidents who visited the grounds during their presidency, as well as other figures who visited and later went on to be president, Schmitz said. A survey conducted by the National Constitution Center recently revealed that fewer American teenagers could identify the three branches of government than could identify the Three Stooges. While I enjoy Larry, Moe and Curly as much as anyone, there is nothing amusing about such statistics, because they reveal an absence of even the most basic knowledge about our governmental structure. Unless we do something to arrest this disturbing trend, I fear that the joke will be on all of us. This trend is disturbing, because only an educated citizenry can ensure that our Nation’s commitment to liberty is upheld and the promise of Constitution fulfilled. A thorough civic education creates citizens who have a strong grasp of the fundamental processes of American democracy, an understanding of community issues and the ability to discuss those issues with one another and with leaders of the community. The Framers of the United States Constitution understood the document that they created to be predicated on the involvement of educated citizens. If we fail to educate young people to become active and informed participants in our democracy, there is no question that our democracy will suffer. Such a failure would betray the trust bestowed upon us by the Constitution’s Framers. The problem of civic illiteracy, as I have come to call it, is a relatively new phenomenon. Unlike some of the issues that ail society, however, the root cause of civic illiteracy is far from mysterious: We simply spend an insufficient amount of time on civics education. When I was a student in high school, my classmates and I received extensive instruction in the operation of government on the local, state and national levels. Such instruction was then typical of school districts around the nation. Today, many school districts no longer make civics a required course or offer only a single one-semester course. Teachers are pressured to gear courses to boost students’ standardized test scores, but the need to create engaged and active citizens is too important a priority to neglect. Students will not learn civics by osmosis. Instead, it is something that they need to work at over a sustained period of time. All too frequently, the civics textbooks now in use do not portray good government as flowing from the connection between the people and the state, but from sheer institutional design. Good government is often incorrectly depicted as an unalterable status quo and not as the result of a continuing, dynamic relationship. Students need to understand that good government is not something that happens to them, but is something that they must help to make happen. In my view, civics education also must take more account of the changing manner in which students learn information. Textbooks will always have a place in teaching civics, but recent innovations can enhance how students learn the subject matter. First, civics education should be more interactive. Students should be encouraged to explore issues like the separation of powers by having debates, mock trials and personal engagement in student government. Students should be encouraged to visit government offices, read newspapers and write letters to elected officials. Civics education should capitalize upon the computer proficiency of today’s students by using Internet-based learning environments. Good examples of online interactive civic education tools have already been produced by organizations such as the Annenberg Foundation and the American Bar Association, and more are on the way. 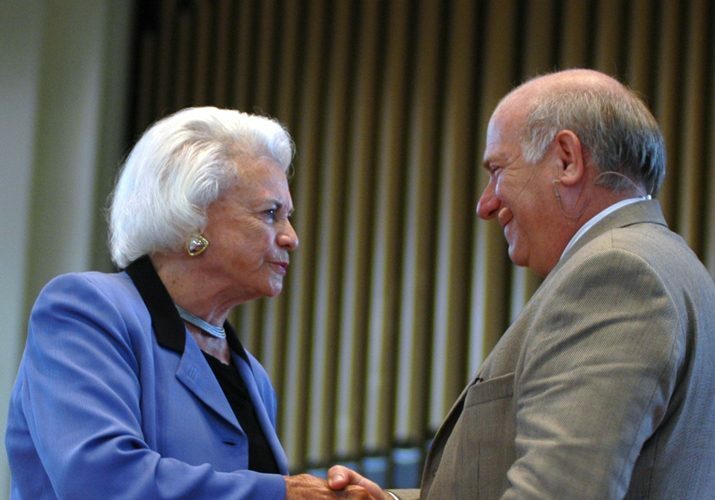 Editor’s note: This column from Sandra Day O’Connor was originally published in the Daily on Aug. 8, 2007, and is being re-published on Oct. 23, 2018, as Justice O’Connor announces her retirement from public life. As the Daily expands its online presence, we will occasionally revisit our archives and digitally publish articles and columns that previously had only appeared in print.